Shortly after the election of current president Donald Trump, the Womens March in 2017 showcased big crowds throughout the U.S., protesting several issues dealing with the country. While the march has seen some controversy since then, several people from Chewelah continue to march every year despite the town’s small population and rural setting, not to mention cold January temperatures. 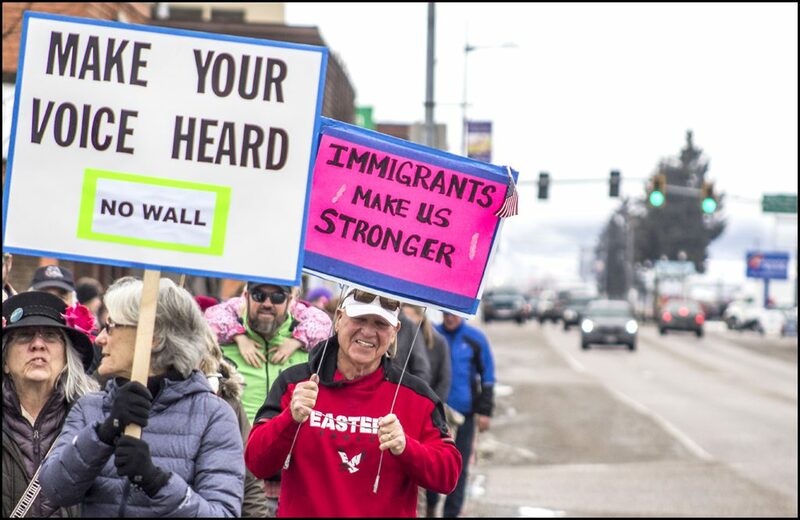 Last Saturday, the marchers were at it again on the snowy, slushy streets of Chewelah, bringing signs, waves, smiles and even dogs. Griepp pointed to the issues of climate change, access to legal status for immigrants, not separating children at the border from family members, supporting rather than gutting the Voting Rights Act, protecting water, air and land quality, the Equal Rights Amendment, complete and safe women’s health care and Medicare for All as some of the core issues marchers wanted to get across. 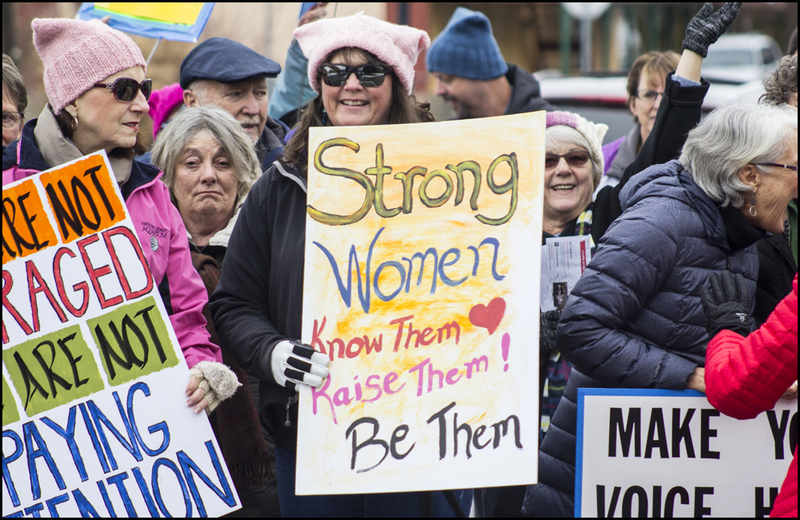 Marchers began at the United Church of Christ, walked down Highway 395 to the Chewelah City Park, crossed the highway in the crosswalk and then proceeded to walk to Chewelah’s one stoplight in town. 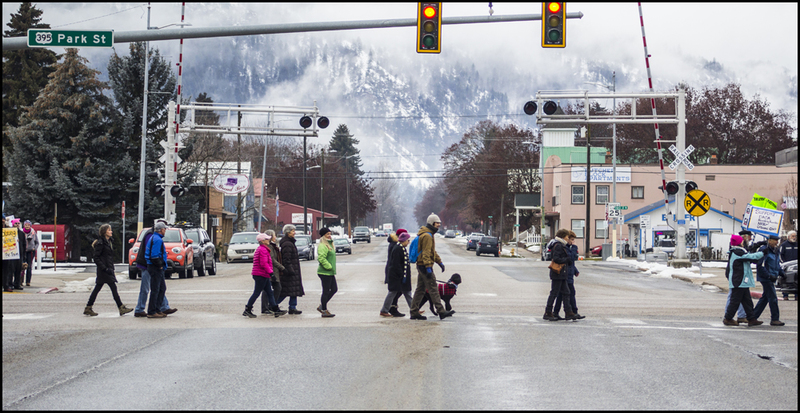 After reaching the stoplight, they paused for several minutes at all four corners of the intersection and then proceeded to walk to Chewelah City Hall where they ended the march. Griepp organized the march through emails, texts and Facebook messaging and the Chewelah United Church of Christ also volunteered as part of community support and outreach to provide a warm meeting spot with coffee and cookies. This year’s march had between 50 to 60 people which is down from last year’s march which had over 100 people. Nationally, march participation was down. This comes after controversy concerning Women’s March national organizer Tamika Mallory, who has publicly praised Nation of Islam leader Louis Farrakhan. Farrakhan is known for his anti-Semitic speeches. While the Women’s March released statements condemning anti -Semitism, the controversy still lingered, and Mallory has declined to denounce Farrakhan. A fellow national Women’s March organizer called for several co-chairs of the march to resign for anti-Semitic and anti-LBGTQIA rhetoric, of which the other founders rebuffed. This caused several regional marches nationally to either be cancelled or dis-affiliated with the national march. Still, several marches did occur including in Spokane. In New York and other cities, there were two different marches, as one was not affiliated with the national Women’s March organization. This March, the Womens March Alliance on the Upper West Side of Manhattan, said it opposed anti-Semitism, and attracted a crowd the length of about 10 city blocks. The national Womens March in the city had a more modest crowd. It was reported that weather may have also contributed to some of the smaller crowd sizes as a large winter storm pummelled the eastern part of the U.S. Several speakers at the marches denounced anti-Semitism and the Womens March organizer for not denouncing Farrakhan. New York Senator Kirsten Gillibrand, Congresswoman Alexandria Ocasio-Cortez, Congresswoman Barbara Lee and House Speaker Nancy Pelosi were among the marchers this year. Griepp said that people are tired of the political posturing, the lies, big money interests controlling government; the hateful rhetoric that is fueling hate groups and tearing at the fabric of communities and the country, influencing youth and growing children in negative ways.